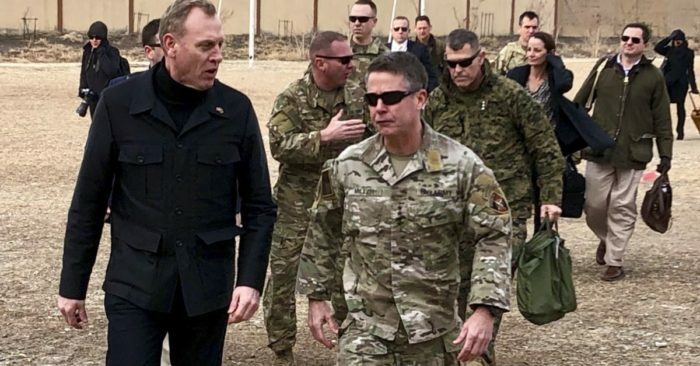 Acting U.S. Defense chief Pat Shanahan said Monday the Islamic State group remains a “global presence,” as U.S.-backed fighters work to clear the last enclave the militants hold in eastern Syria. “But in the context of military operations, I think the characterization of progress within Syria has been that they have been decimated and that we’re making significant progress” in the Middle Euphrates River Valley, Shanahan said. Last week, U.S. Secretary of State Mike Pompeo sought to reassure allies the United States would not abandon efforts to destroy Islamic State when it withdraw its troops from Syria. Shanahan said Monday he plans to discuss the situation this week with NATO allies, including support and security operations that he says are important when shifting away from a significant military operation. The U.S.-backed Syrian Democratic Forces said Sunday they had recaptured 41 positions held by Islamic State militants in eastern Syria. “#SDF have advanced on northern and western axis into Baghuz since 19:00 yesterday evening, capturing 41 positions of ISIS and destroying fortifications. IS counterattack was foiled at 4 am this morning. Heavy fighting is going on inside the last village at the moment,” he wrote. SDF officials and the Britain-based Syrian Observatory for Human Rights estimated there were about 3,000 battle-hardened IS jihadists, mostly foreigners, in the region. The observatory also estimated that several hundred civilians remained in the area as well. The civil war that has engulfed Syria began with Arab Spring protests in 2011. The United Nations estimates more than 400,000 Syrians have died since fighting began in 2011. More than 6 million Syrians have been displaced internally and about 5 million have sought refuge outside the country, with Turkey hosting nearly 3.5 million of them, according to the United Nations.